A motorcycle rider popularly known as ‘Okada rider’ has cried out for help after his wife welcomed a set of triplets. 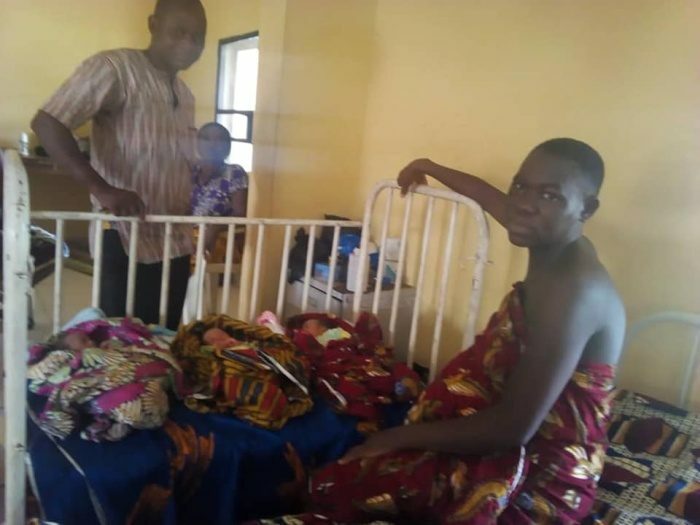 The new mother identified as Mrs. Igwe Justina from Mbiri in Ika North East local government Area of Delta State, successfully gave birth to triplets, two females and a male at the Central Hospital in Agbor area of the state. Two years ago, the mother of the triplets, an unemployed NCE holder – gave birth to a set of twins.. Speaking with Tsm Reporters, the husband named Mr. Camilus Igwe, an unemployed University graduate (B.sc Econs), now a Father of five hustling as a motorcyclist in Agbor – glorified God for his mercies that saw his wife through what he called a Titanic battle. “I am short of words, please Delta State Government , politicians , businessmen, well- to -do individuals, NGOs , clergymen should come to my assistance ; the load too much , one room apartment can’t contain us, Okada money can’t feed , clothe or provide drugs for the kids, I am confused right now , so many things racing in my mind but I know that my God liveth, -God will send my helpers” he posited. The beautiful kids are still cooling off at the Post Natal ward of the Central Hospital, Agbor.